There wasn’t a biography of George Washington published until 1842, which was 43 years after he died. True, the book industry and the publishing process was much smaller at the time, but hey, the father of his country? The book Life of Washington by Anna C. Reed sealed the deal on many of the stories about our first president: the chopping down of the cherry tree, the silver dollar across the Potomac, the Valley Forge winter. Books matter. In this centennial year of Babe Ruth’s professional and Major League debut, it is interesting to note that the first book about him was not published until 1930, by which time he was already one of the most recognized people in America. A book called Babe Ruth’s Own Book of Baseball, by Babe Ruth, was published in 1928. It was largely instructional with occasional references to on-field moments, and it was believed to be written by Ford Frick, who would later become president of the National League and the commissioner of baseball. There is little in it that would give it grounds to be called an autobiography, something Babe finally got around to in 1948, the year of his death, in a book co-authored by Bob Considine. In the early 1920s, Ruth sat down for lengthy interviews, believed to be with Westbrook Pegler. These interviews were very much autobiographical, running as a series in the Atlanta Constitution newspaper. It was presented in the first person – readers did not know who was doing the interviewing and writing – and it came out in 1922. These were assembled as a book in 2011. The 1920s version was not a book. So there was no Ruth biography done after his sale to the Yankees, nothing after “The House that Ruth Built” opened and nothing after his 60 home run season. The whole decade of the ’20s was Ruth-bio free. Dan Daniel penned this Ruth biography in 1930s, complete with player reflections of Ruth and images from Charles Conlon. “I’ve answered this many times in the past, and one more time I am telling you, no, no one has ever hit a fair ball out of Yankee Stadium!” he would write. 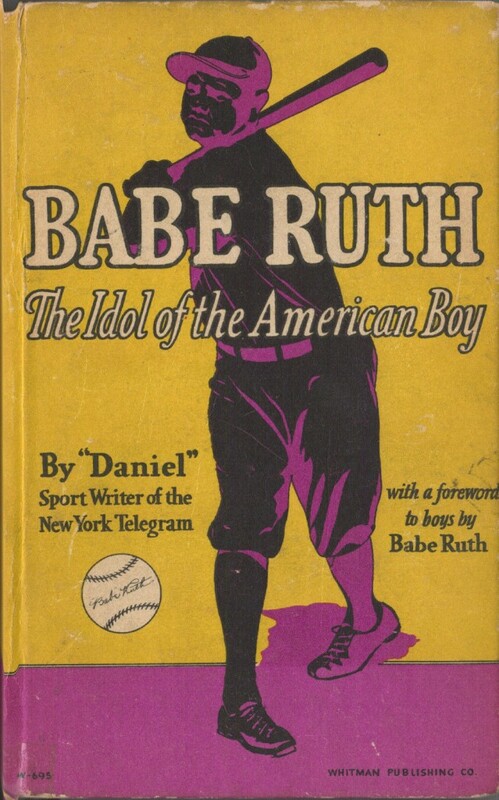 Presumably in a better mood, Daniel began work on Babe Ruth: The Idol of the American Boy, with the cooperation of Babe’s agent, Christy Walsh. Walsh, Daniel acknowledged, provided “courtesy and help in allowing us to use the material in this book.” He also thanked his employer, stating, “By arrangement with and the courtesy of The New York Telegram,” suggesting portions of it may have run in the newspaper. The book, intended for a young audience, was published in 1930 by Whitman Publishing of Racine, Wis., best known for its children’s books. The finished product was the size of a paperback, 5-by-7½ inches, except it had a hard cover. It ran 106 pages and features photos by baseball’s first great photographer, Charles Conlon, as well as three pages of statistics, breaking down Ruth’s 516 home runs (as of 1929) and showing his year-by-year hitting as we are accustomed to seeing. “All you baseball writers marvel that a young left-handed pitcher should have developed into so great a home run hitter, when, as a matter of fact, Ruth was helped greatly by discovering his power while he was a hurler,” said Cobb. There are some little anecdotes that charm. One hundred years ago, for instance, when he broke in at the Baltimore Orioles training camp: “Until Ruth arrived in camp he never had been on an elevator. The first trip to his room on the third floor filled him with an amazing exhilaration. He set down a paper valise he had bought for a dollar to hold all his belongings and kept riding on that elevator in a series of startling adventures. 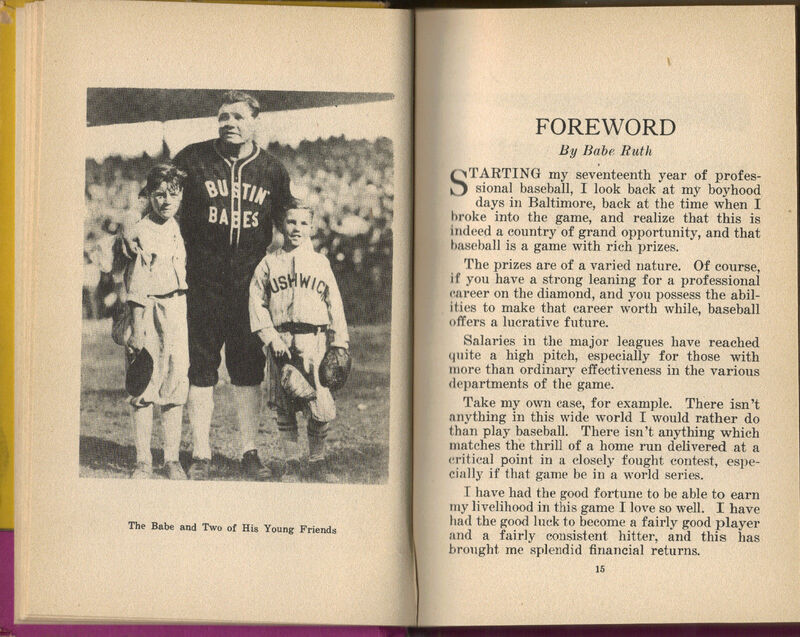 The book contains a foreword by the Babe (courtesy of Christy Walsh), in which Babe implores young boys to 1.) get eight hours of sleep, 2.) avoid tobacco in any form, 3.) do everything in moderation, 4.) not over-exercise and burn out, 5.) not to strain their eyes and to maintain perfect sight, 6.) practice obedience at home, at school and on the ball-field, 7.) be able to “take it” – gameness being vital in baseball and your lifework, 8.) love and respect your home ties. “Nobody in this wide world can match your mother and your father in deep personal interest in you,” 9.) Be neat in everything you do – in action and dress and language and 10.) the truthful boy goes farthest. He who is square with others will be square with himself. If Babe even read this foreword, one wonders what sadness he might have felt talking about mothers and fathers – two people who didn’t really exist in his childhood. Anyone reading the book during the years of the Great Depression would be swept away by the portrayal of what Babe Ruth meant to baseball and to the youth of America. It is hardly a “warts and all” biography, but it is typical of the early literature of the game in which hero worship is encouraged. Dan Daniel wrote for more than 60 years before retiring to Florida, where he died in 1981. No one wrote more stories for The Sporting News than he did, and he was said to have written most of the editorials attributed to J.G. Taylor Spink, as well. He never had another book published, but he worked on an autobiography project with Jacob Ruppert, which was, regretfully, never completed.